Summary: Cat and Patrick were best friends. Soul mates. But have grown apart over the past 3 years. However, when Cat hears about the horrible hate crime which has put Patrick in a coma, she knows that is up to her to truly get to the bottom of the story. Shine follows Cat as she finds out the truth to determine who is the one who hurt her friend. What I Think: This is a book about more than just finding a criminal. This is a book about overcoming past injustices and obstacles and ultimately finding out the truth. The truth not only about the hate crime at hand, but also Cat finding out the truth about herself and others in her town. It is also about the thin line between good and bad. It is always not clear which side of the line someone falls. And sides change easily. This is an important book to have around and ranks up there with books like Speak as a book that is just so tough to read, but so important to share. I loved how the plot was put together as well. As you read, you become one with Cat. You feel her pain, her frustration and her joys. You cry with her and you laugh with her. You truly love her by the end of the book. And as you follow her, the book unfolds like a road map with more and more of the information being given to you each day that Cat investigates Patrick's attack. Then at the end of the book, all the information fits perfectly together and the puzzle becomes clear to all. I have heard nothing but good things about this book from the minute ARCs were given out at ALAN 2010. However, I was still worried about the integrity of the book since it was dealing not only with a very touchy subject, but also could easily offend a whole region of people. But Lauren Myracle wrote this book with polished purity. Read With: I'll be honest- this book is so very unique that I can't even think of any books to ladder with it. 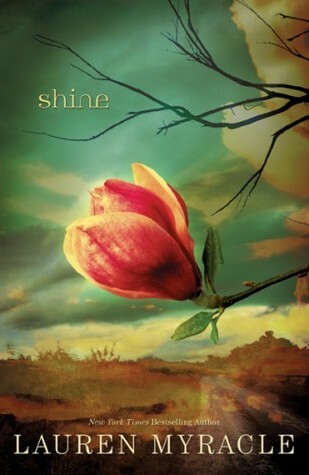 I thought about listing some great LBGT books, but Shine was more than that. Then I thought about mysteries, but I have never read a mystery like this one. The only mystery that I could think of is Thirteen Reasons Why by Jay Asher because they both are mysteries in an uncommon sense and deals with injustices. Writing Prompts: Anti-bullying has become a focus in schools around the nation; do you think that bullying is an issue that needs to addressed at schools?